Hello, so today I’d like to share my thoughts on the University so far and what it’s like in general. 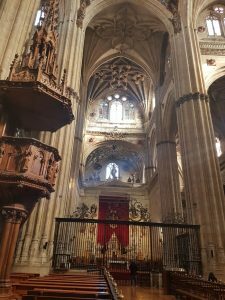 Firstly, the workload at the University of Salamanca is pretty intense and I have a lot less free time than I would in England. Just to give you a rough idea I have 23 hours of class a week and there’s homework for most classes. Therefore, as you can imagine I’m pretty busy but during the weekends I always try and fit in a day trip and the fiestas here are some of the best due to it being a student city! Salamanca itself is a very historical city and has a lot of nostalgia to it. It is the third, oldest functioning university in the world! 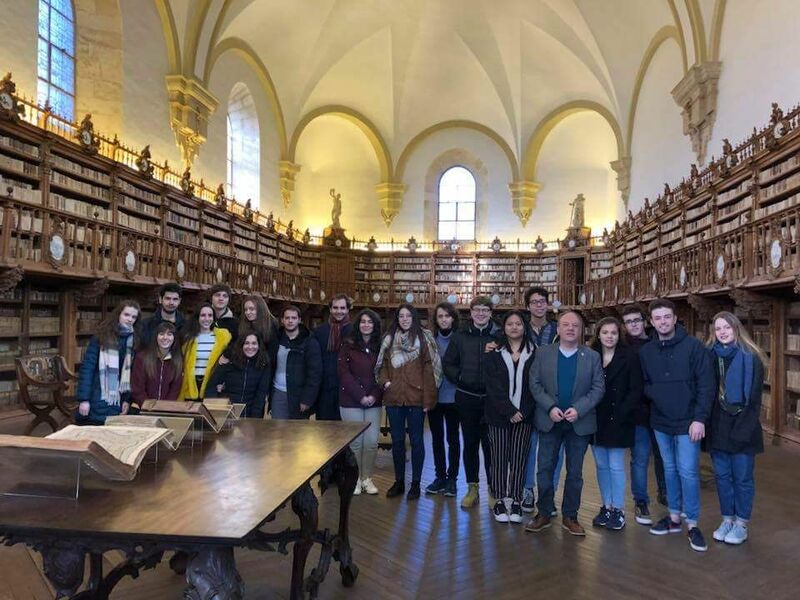 I found out that it is the oldest in Spain and prestigious British universities such as Oxford and Cambridge copied Salamanca’s architecture and university style because Salamanca was a very prestigious university where many famous people studied such as Fray Luis de León (a Spanish poet). It was founded in 1218 and will celebrate its 800th birthday this year in 2018, so it’s a great time to be here! As I’ve mentioned in a previous post I am currently living in a University residence. Last week, there was a trip for some of us to visit the famous library, which is now regarded as a museum. We had a talk from someone who worked there and he showed us some of the books. It was incredible!! It felt like I was on the Harry Potter set! After, we visited the old lecture theatres where Fray Luis de León used to teach his pupils, it was all very surreal. This is a typical tourist attraction and all the tourists that come to Salamanca will most likely go inside. Of course, there is the famous, beautiful cathedral and also other beautiful buildings and architecture to also admire. Today, we actually got a little bit of sun and the city transformed itself, there were tables outside, a queue for the tourist train and lots more people and children running around the centre. Of course, this week and next week is Easter and therefore many people are off work and school. I break up on Thursday and we have a week of holidays which I will be using to explore more of Spain!